Wing Commander Rolf Arne Berg leads the Norwegian Spitfires of 132 Wing on a low-level attack against a German command post near Dunkirk, winter 1944. 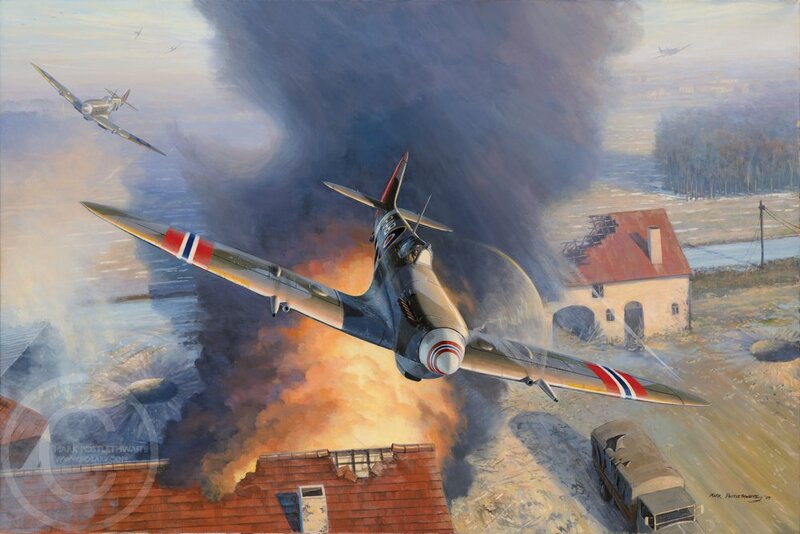 This painting was commissioned for the Norwegian Armed Forces to celebrate on of their greatest WWII pilots Rolf Arne Berg. We wanted to show him flying his specially marked Spitfire in action, ideally in air combat. Unfortunately, these special Norwegian markings were only applied to his aircraft for a very short period, as the Allied HQ didn't approve and made him remove them! Once we found the period in which they were carried, we checked through his logbook and found that the most interesting action was this low level attack on a German command post near Dunkirk. It would have been lovely to paint this Norwegian Spitfire in combat with Fw190s but sadly it would also have been historically inaccurate.